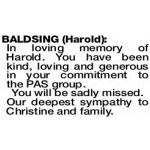 BALDSING HAROLD Captain Harold Baldsing Beloved Husband and Father passed away in the early hours of Sunday 24th March 2019. He was the finest example of a human being many of us have ever known and will be missed by his wife Christine, 5 children and 4 grandchildren. Services to be held at Our Lady of Mercy Girrawheen. Family and friends are invited to say farewell. Dad would appreciate a donation to St Vincent de Paul in lieu of flowers. 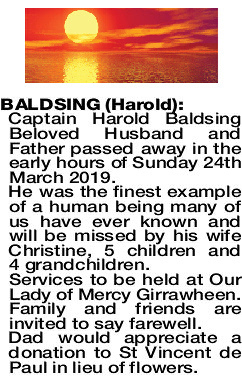 The Funeral Mass to celebrate the life of Harold Baldsing of Alexander Heights will be held at Our Lady of Mercy Catholic Church, 5 Patrick Court, Girrawheen on FRIDAY (29.3.2019) commencing at 2.30pm. Rosary will be recited at Our Lady of Mercy Catholic Church on FRIDAY (29.3.2019) commencing at 1.30pm. 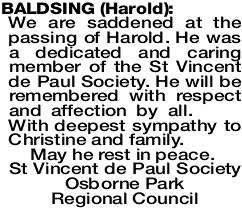 In loving memory of Harold. You have been kind, loving and generous in your commitment to the PAS group. You will be sadly missed. Our deepest sympathy to Christine and family. We are saddened at the passing of Harold. 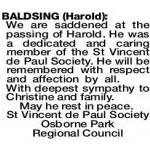 He was a dedicated and caring member of the St Vincent de Paul Society. He will be remembered with respect and affection by all. With deepest sympathy to Christine and family.